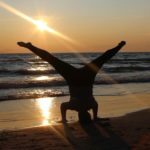 Yoga is becoming increasingly popular; there aren’t many cities you could go to without finding a yoga studio with a variety of different classes. However, one of the more recent trends in yoga is Story Time Yoga. This is a 30-45 minute class targeted to children between the ages of 18 months and 5 years. 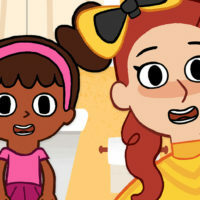 In these classes, stories are used to help the children remember and repeat the poses. Here are the 5 simplest poses to teach toddlers that are derived from Story Time Yoga, but can be done one their one with your little ones. Why? This pose is particularly simple as it only involves standing up straight, with your arms either at your sides or overhead. Sometimes I have the toddlers raise their arms above their heads and clap. They love anything to do with clapping, as it makes them feel like they’re doing something worth celebrating! The benefits – Mountain pose helps with posture. It also helps strengthen the legs, lower back, thighs, knees, and ankles. Why? 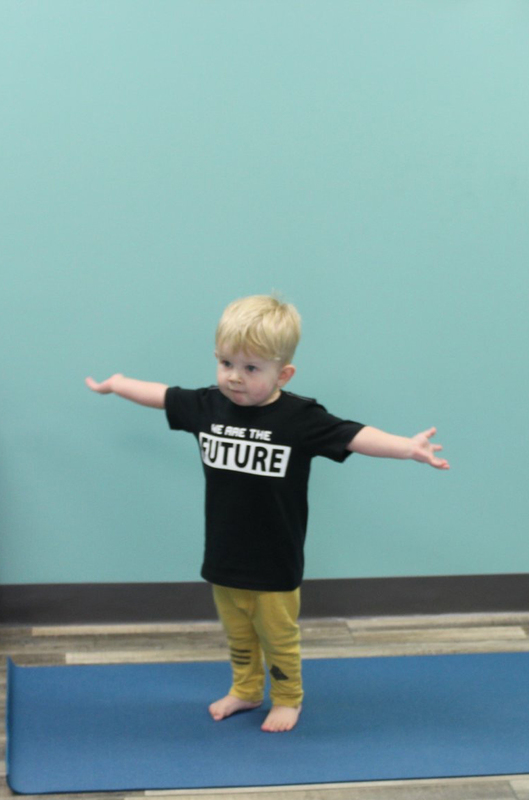 This pose is exciting for toddlers as they are now finally mastering walking and running, and anything new that they can learn to do with their legs makes them feel like a big boy/big girl. 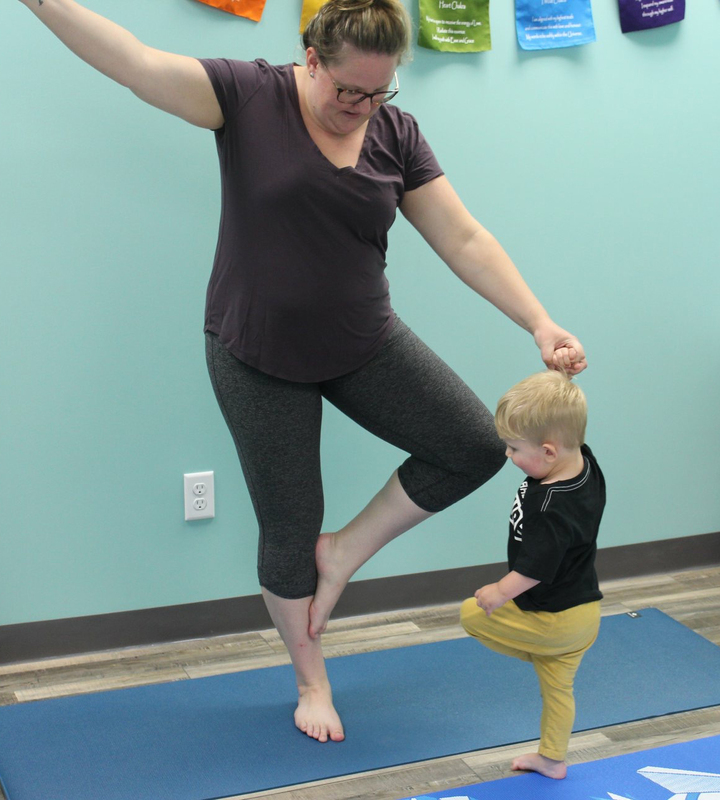 We start out by holding our toddler’s hand and encouraging them to lift one leg up and touch their other leg with it. Eventually, once they gain their balance, they can lift the foot up without holding your hand. Benefits – The benefits of tree pose are that it helps to stretch the thighs, torso and shoulders. It also helps to strengthen the ankles, calves and abdominal muscles. Why? 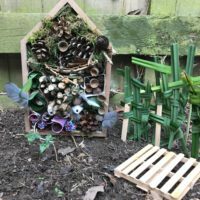 This one is fun for toddlers and easy to do. 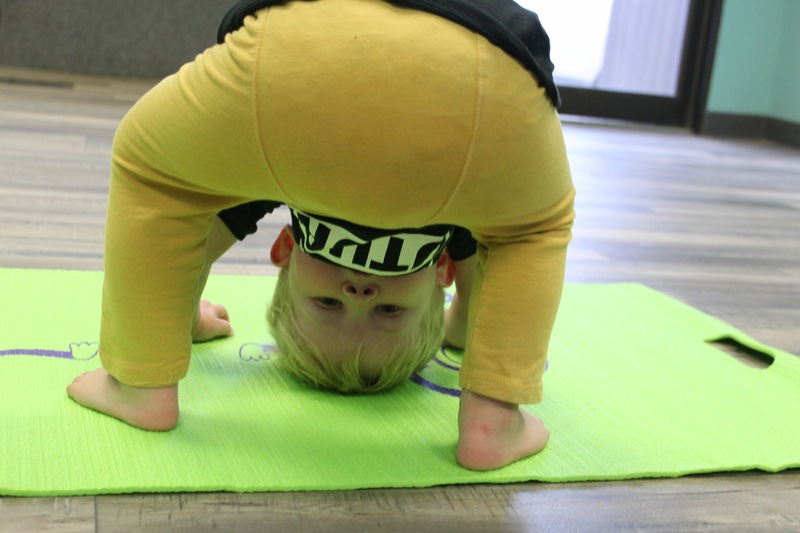 Toddlers are constantly observing everything around them, and having their hands on the floor, heads upside down, and looking through their legs can help them see their surroundings from yet another different perspective. We try to encourage legs hip-width apart, but we allow toddlers to explore and learn on their own terms as well. Benefits – The benefits of downward facing dog include strengthening the hands, wrists, hamstrings, and calves. It also helps decrease back pain as it strengthens the entire back and shoulder girdle. Why? This pose is fun because most toddlers know they aren’t allowed to touch walls with their feet. When they are asked to come close to the wall, sit down, and walk their feet up the wall; you can see the wonder in their eyes. 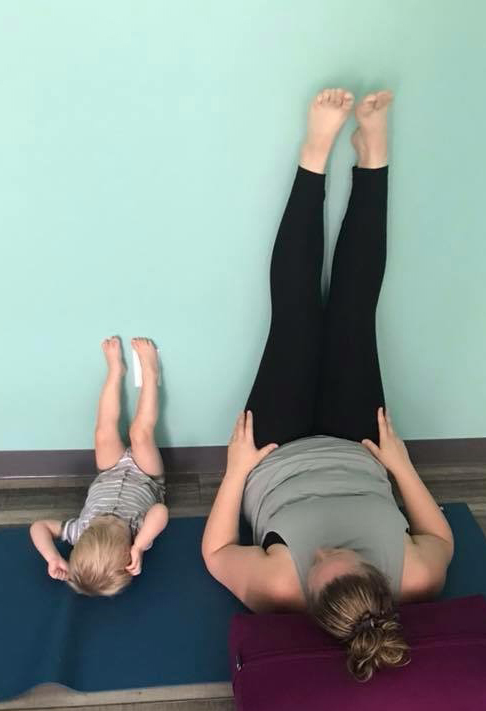 You can also encourage toddlers to stretch their legs wide on the wall. Benefits – Legs up the wall has many benefits. It is more of a restorative pose, so it allows the mind and body to relax. It also helps to increase circulation, relieve lower back pain and helps to soothe feet and legs. 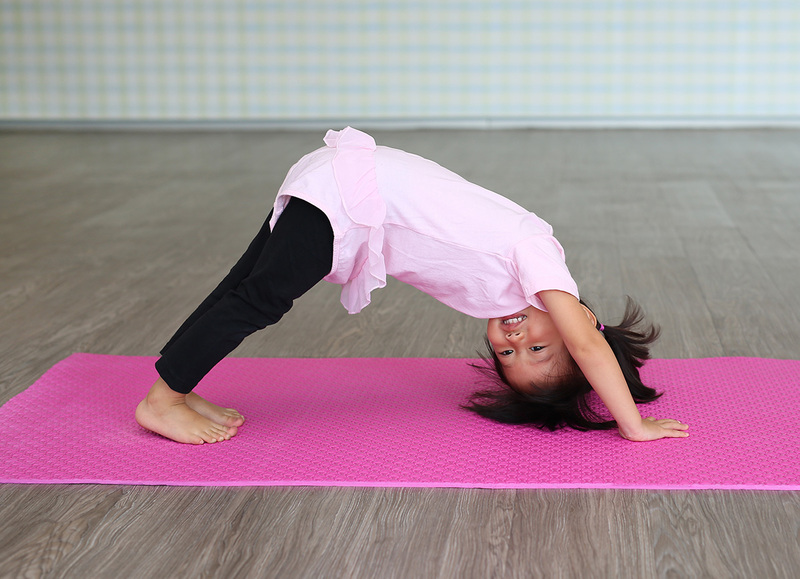 Toddlers are busy little people, so adding a pose like this to a practice is even more important. Why? Happy baby pose is one of the simplest poses to teach young. Most babies spend a lot of time on their backs, exploring their feet. It’s almost like second nature to ask your toddler to lie on their back and hold their feet. Benefits – Happy baby pose helps strengthen the outer hips, chest and shoulders, it also helps to lengthen the spine and relieve lower back pain. 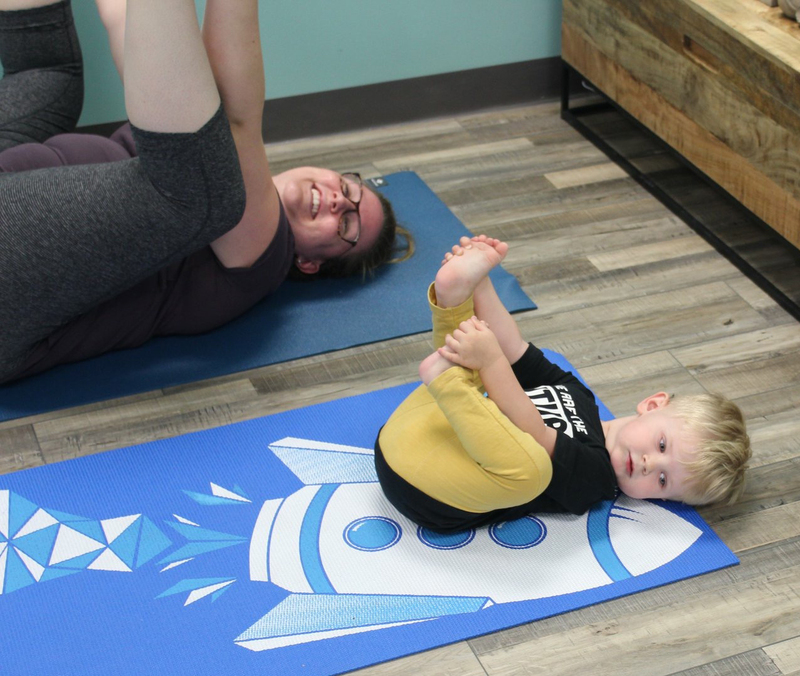 Now that you know the 5 simplest yoga poses for toddlers, try teaching them to your toddler, or see if Children’s Story Time yoga is offered in your community. 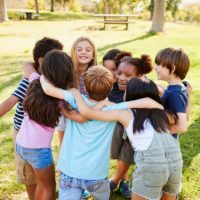 Learn, teach, stretch and enjoy!